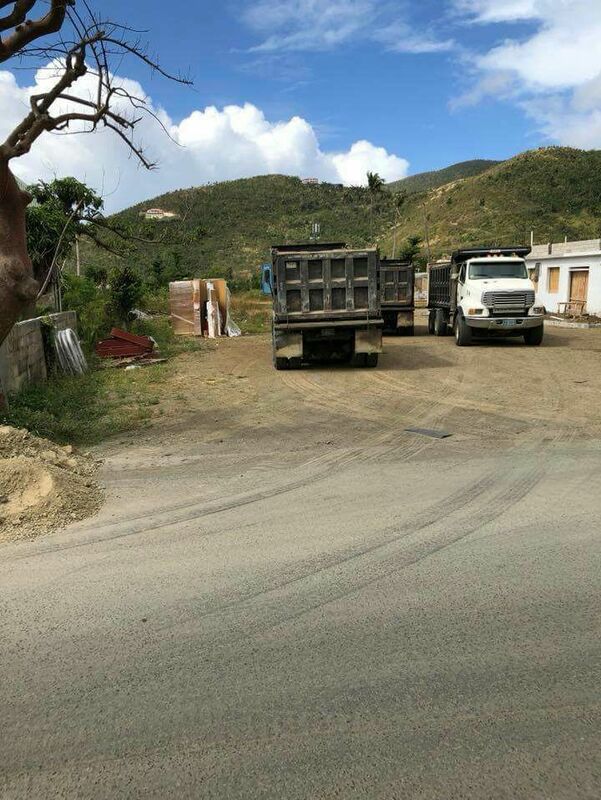 You are here: Virgin Islands News Online » News » Finally some attention paid to Third District roads! Many have argued even before the two killer storms last year that roads where bad and there were many questions as to where the $16M borrowed from the local Social Security Board in 2015 to carry out road repairs and rehabilitation went. 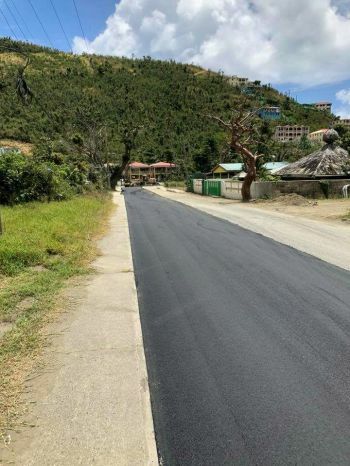 The piece of road next to the Ebenezer Thomas Primary School in Sea Cows Bay, located in the Third District represented by the Hon Julian Fraser RA, was one of the most deplorable strips on Tortola, as it was a dirt track. The students, teachers, parents and other support staff at the school had to endure the dust for well over five months and persons attending the many funerals or going to religious services in the last five months at the Sea Cows Bay Methodist Church had to endure the dusty conditions. The poor state of the road also affected many residents living in the immediate area. A few days ago a food stall was erected close to the area adjacent to the new gas station under construction and many on social media were wondering how it would survive those serious dusty conditions, because of the road situation. Is there discrimination against D1 & D3? The two Opposition Members, Hons Andrew A. Fahie (R1) and Fraser, have long told their people that since the 2011 general elections the ruling National Democratic Party (NDP) Government has discriminated against their districts. Premier and Minister of Finance Dr The Honourable D. Orlando Smith (AL) and Communications and Works Minister Hon Mark H. Vanterpool (R4) have both denied the allegations, and often pointed to projects in those districts undertaken by the NDP Administration. After much public pressure from Hon Fraser in the House of Assembly and questions asked in Parliament, today Sunday March 25, 2018 action was finally taken. The strip of road was graded and asphalt placed on the top of the road by Public Works Department (PWD) and Tortola Paving Limited. The Representative, Hon Fraser, was even on hand to help level the asphalt and was seen giving instructions. 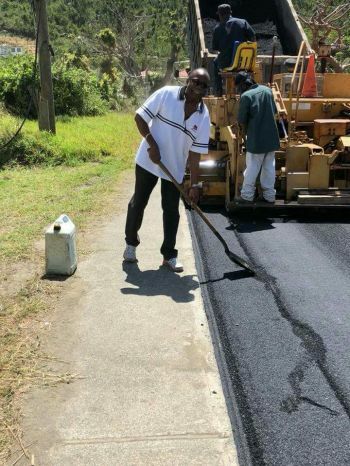 He also posted images on his Facebook page with the good news on the road, as the works were progressing. 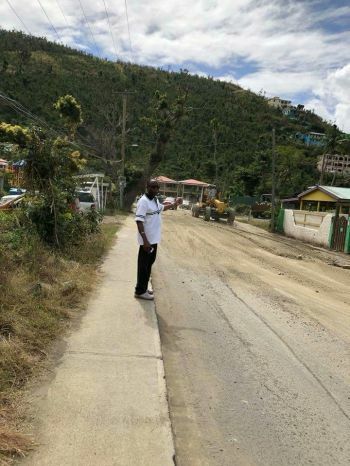 Meanwhile, in a strange twist a few days ago, Hon Fraser also raised the issue about the poor roads in the Seventh and Eighth Districts, both held by two NDP members, and called on Premier Smith to place money in the budget for roads. 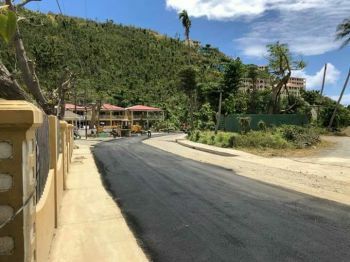 It is unclear when there will be road repairs in other areas on Tortola and on the sister islands. You will see some cosmetic repairs now because Disney and Norwegin are coming to look . How they say ndp hate zone 3? Today was the happiest day of my live - since IRMA! The road is fixed! Thank you Action Man Hon. Mark for keeping your promise, given in the HoA last week. The community around the School and Church is VERY grateful. The roads in Sea Cow Bay (Seek-a-Bay) as the rest of the territory needs a comprehensive design, construction and maintenance. But what is up wid the photo op? The Hon Fraser is not doing any real work; how can one tell? He is not wearing any steel toe shoes, hard hat, eye protection, safety vest........etc. Get out of the way and let the people dem do dem wuk. The whole lot of them NDP are sickening. Talk talk talk. Before that road by the courthouse in John's Hole can be repaired, the have to get the owner of the house on the hillside to stop letting out water on the road. Where is the oil or the tar that is put down before the asphalt so that it can bond together and act as a water barrier? Look waste of money again. Pot holes b next weekend. If that is true it will be better to do it right because it will save money. This government will understand when we all wake up one morning and find a UK ship in the harbor that the Premier cannot turn back and the rest will be history. For the sake of the ISLAND and people do things the right way. By next week there will be a puthole . They do the job half as. Third district has the best roads. The only problem is by the school, and if they stop allowing water to run in the roads, that would fix the problem there.